The Kentucky Horse Racing Commission has approved noted horseman and entrepreneur Ron Winchell and prominent gaming executive Marc Falcone as majority owners of Kentucky Downs. The sale of the track and year-round entertainment center to Winchell and Falcone is expected to close around March 1. Ted Nicholson will continue as Kentucky Downs’ senior vice president and general manager, a post he has held the past three years during which time both the Historical Horse Racing (HHR) gaming operation and live race meet have experienced record-shattering growth. “A lot of work to do, but as Ron said, we’re very excited to come to Kentucky, own Kentucky Downs and do great things for Kentucky racing,” Falcone said. While awaiting approval, the new owners have been working on plans for a major facility expansion. “I don’t know when we can actually announce something, but we’re working pretty fast on stuff,” Winchell said. 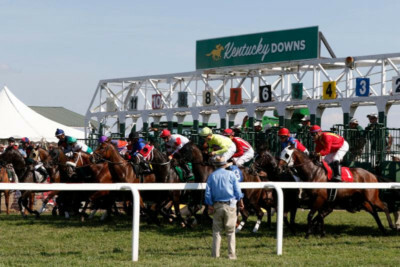 Winchell and Falcone — who are purchasing Kentucky Downs’ assets through their new company Kentucky Racing Acquisition LLC — are familiar names in the racing and gaming worlds. Winchell oversees his family’s Winchell Thoroughbreds, a high-end racing and breeding operation located in Lexington, Ky., that currently owns more than 120 horses, including racing and breeding stock. The Winchells were co-owners of 2017 Horse of the Year Gun Runner, now a popular stallion at Three Chimneys Farm, and raced renowned sire Tapit, in whom the family still owns 50-percent interest. Ron Winchell also operates more than 20 gaming locations across Nevada. Falcone brings significant financial and gaming experience to Kentucky Downs, having previously served as Executive Vice President VP, Chief Financial Officer and Treasurer of Red Rock Resorts, Inc and Station Casinos from 2011 to 2017. His previous investment business background includes Goldman Sachs & Co., where he focused on restructuring transactions in the hospitality and gaming sectors; Deutsche Bank Securities Inc., where as managing director he was recognized as one of the gaming, lodging and leisure industry’s top analysts; and Bear, Stearns & Co. Inc. Located near the Kentucky and Tennessee border, just off Interstate 65 and approximately 35 miles from Nashville, Tenn., Kentucky Downs features more than 750 Historical Horse Racing machines and conducts live turf racing each September on America’s only “European-style” race course while offering among the highest purses in the world. Kentucky Downs is a pioneer in modern Historic Horse Racing, the electronic form of pari-mutuel betting on horses gaining nationwide recognition as one of the great financial success stories in the sport’s history.